~ We brew craft beer for those who deserve it most – Regular Guys! It seems just as we say hello to the weekend, we sadly have to say goodbye. The Regular Guys had a pretty productive Friday night. 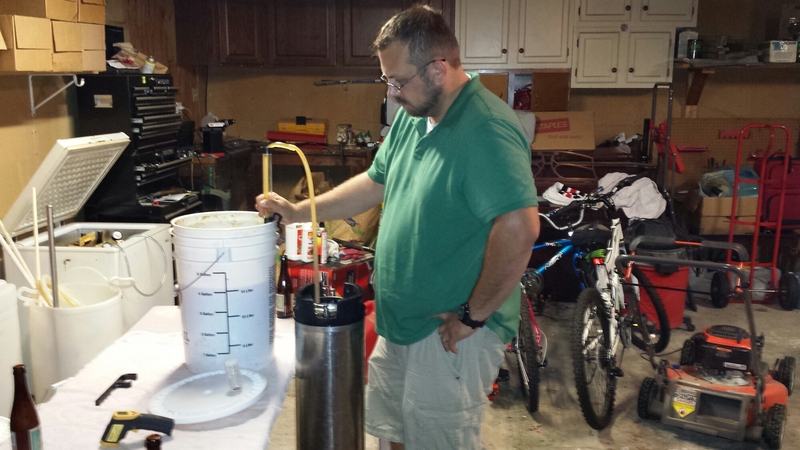 We got together and bottled our Hot Blonde Jalapeño Blonde Ale and kegged our EPA. Then we had a well deserved night out for research and development of course! Let’s start with the Hot Blonde. Lately we’ve been tinkering with our recipes, taking everyone’s comments and suggestions to heart and combining them with our own ideas and meeting somewhere in the middle. We then make minor adjustments to our recipes and see how it turns out. The Hot Blonde may have been a little too spicy and we’ve been trying to figure out exactly at what point all that spiciness comes in. 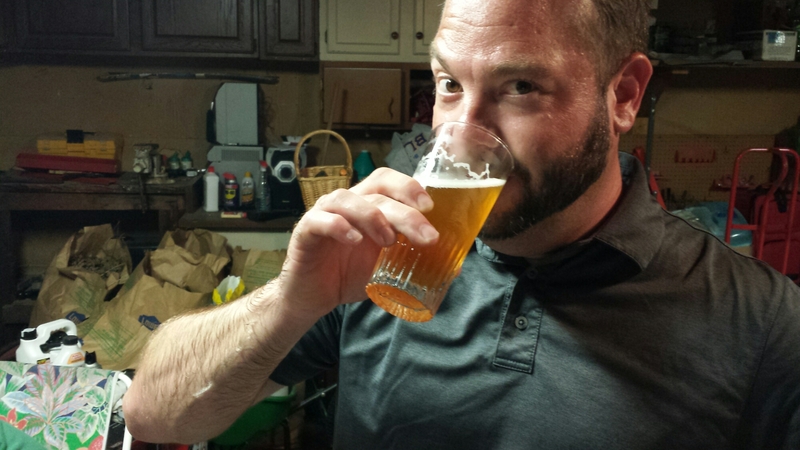 Well, we figured it out and an incredibly delicious beer was born! How about some pictures? Ok! We know this isn’t a “proper” glass for a blonde ale, but we aren’t picky. 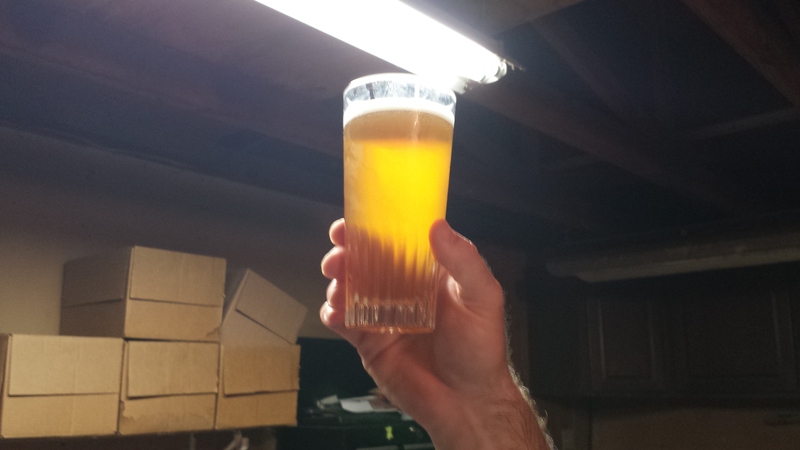 This is hand model extraordinaire Brian showing off the color and clarity of our brew. She’s a pretty beer! This is also Brian enjoying the Hot Blonde. You can tell he approves by his eyebrow. Seth is a pro. He’s the only one we trust to fill our bottles. I’ve tried, and was really bad at it. Up next is the unnamed EPA. We’ve brewed this beer three times now and we’re hoping this version will be the recipe we can stick with. Let’s picture shall we? We shall! 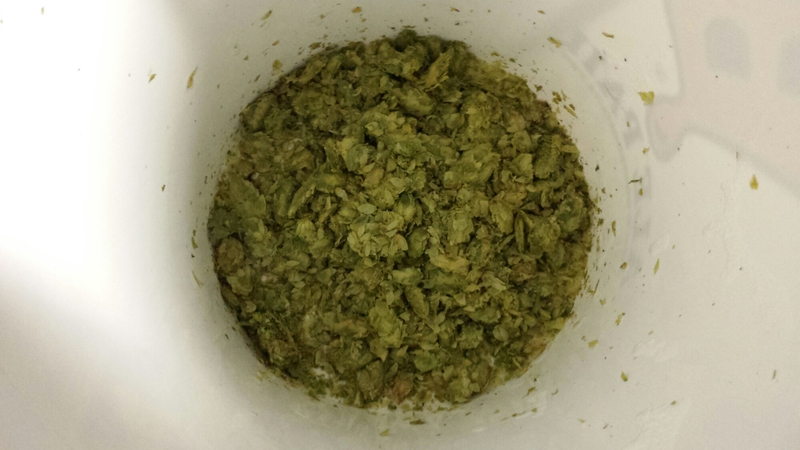 Secondary is complete and by the aroma, the dry hop went splendidly! 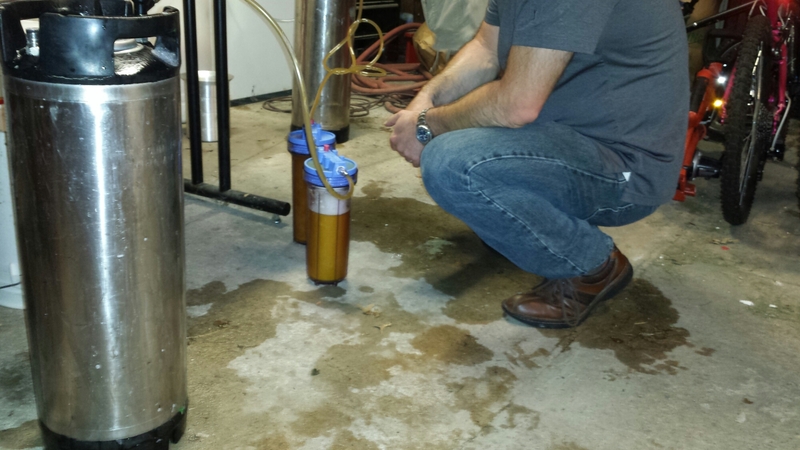 Brewmaster Seth is overseeing the transfer of the EPA to keg number one. Brian is keeping a close eye on the filters. Here’s a closer look at the filters. There’s some ridiculously good looking beer in there! 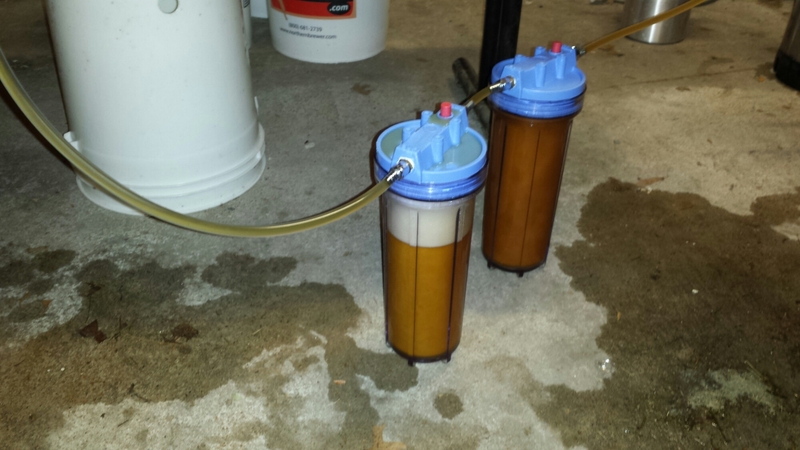 And finally, the filtered EPA is being transferred into keg number two. 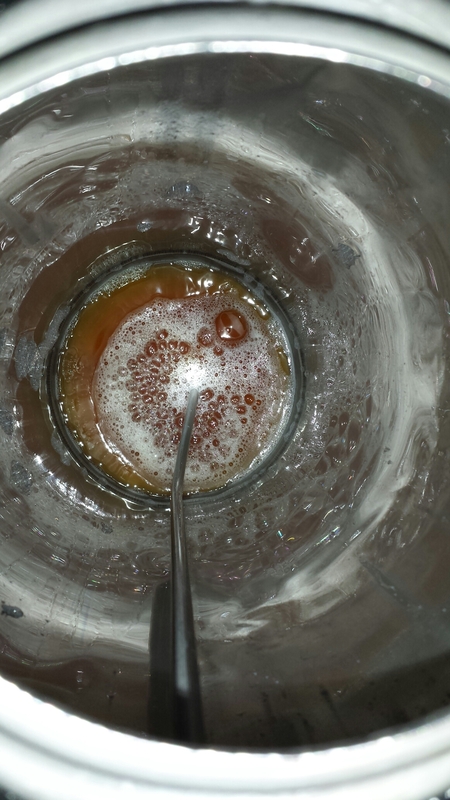 It is now being carbonated and we’ll get to test it out on Friday! I hope you all have a fantastic week or at least a tolerable one! Oh my god, you guys, oh my god. Friday night the Regular Guys got together and got some work done. I’m talking about a ton of work. 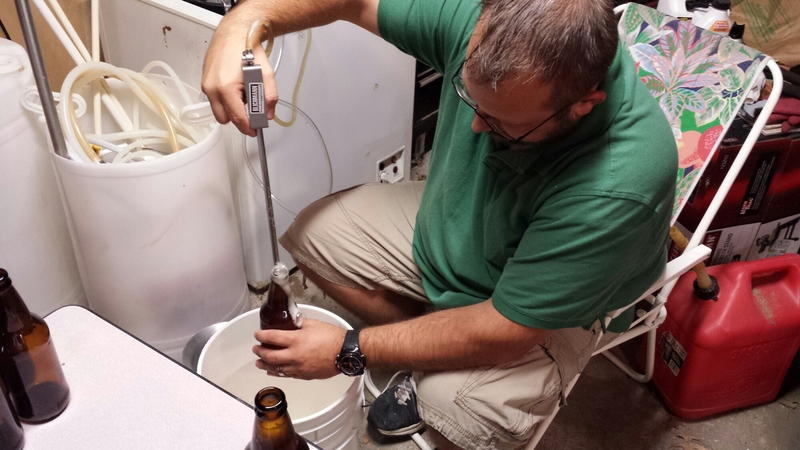 Most of the work was brew tech related and Seth is going to fill you in on that. What I’m going to tell you about is our yet-to-be-named EPA. 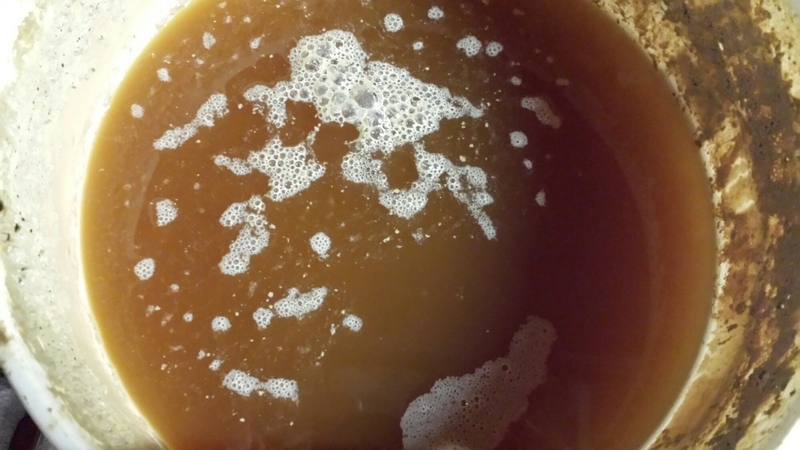 First of all, the EPA had a VERY active fermentation. Brian said that it was so active that the top actually blew off twice! Not just once, TWICE! Luckily he was home both times and barring a mild heart attack, he was able to get the lid back on quickly. Here’s a picture of the EPA in primary. 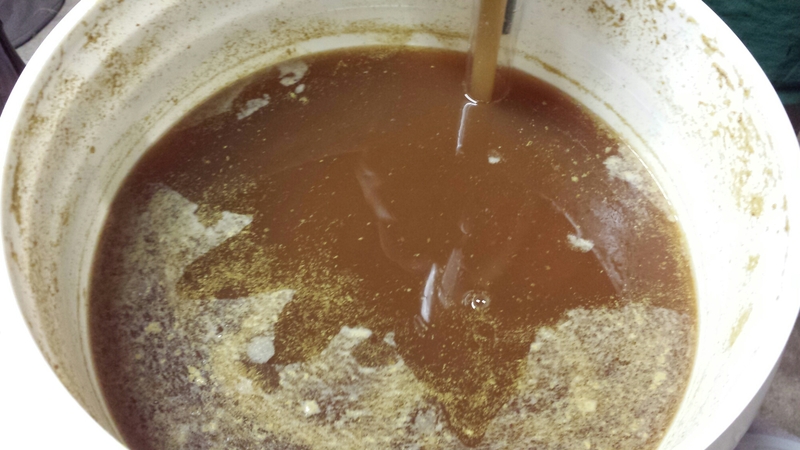 The remnants of the krausen show just how active the fermentation was. This beautiful beverage isn’t even ready yet and I’ve gotta tell ya, the aroma was quite possibly the best smell that has ever entered my nose. No harsh fumes, no hot alcohol tones, this is going to be a beast. Especially after you see the amount of hops that went into secondary! Holy cow that’s a lot of hops! 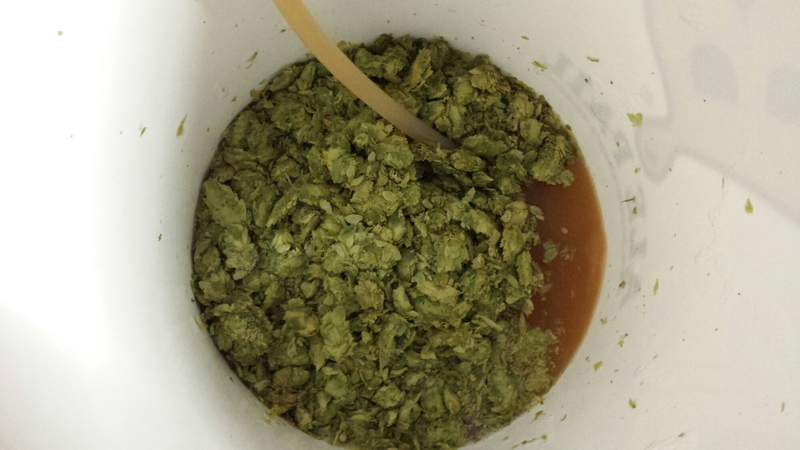 We went with a glorious mixture of Columbus and Simcoe hops. Next picture! This is the Columbus and Simcoe hops welcoming our EPA into their home. Remember how I said up there how our EPA’s aroma was the “best smell that has even entered my nose?” I lied. Our EPA mixed with the Columbus and Simcoe is the best smell that has ever entered my nose! And here we have the final product. 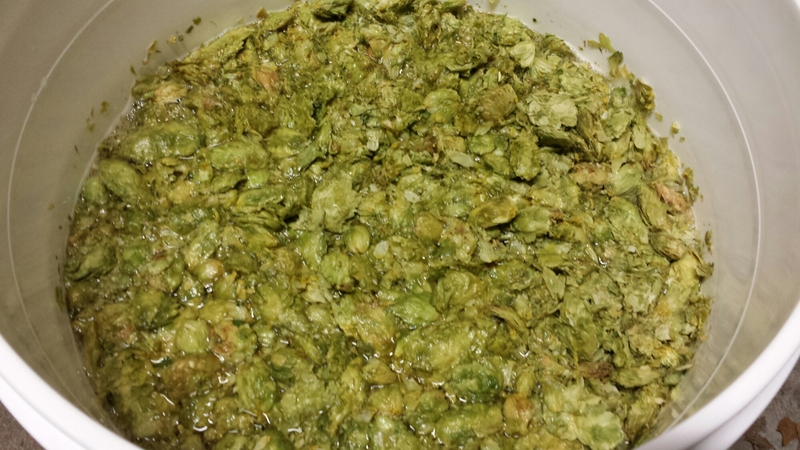 The hops are soaking up the EPA and are going to do their magic. It will bathe in the hop addition in secondary until Friday where we’ll transfer to the keg for carbonation and soon after, we’ll be able to enjoy. I really can’t wait to try this version of the EPA. Seth did a lot of hard work recalculating and reworking the recipe to make it just right and I have full confidence that it’ll turn out great. It’s Breese Fest time babies! 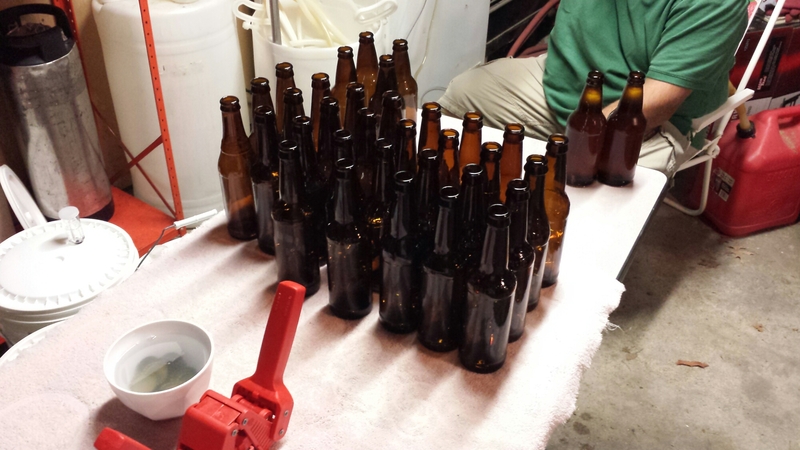 Did we Solve our Carbonation Problem?!? It’s the home stretch folks!